You and I are creatures of habit, are we not? We like our certainty, to stay within our comfort zones and to live the way we’ve always known how to live. But what if you could have more? What if you could live better? Would it be worth getting out of your comfort zone, changing your ways? Just suspend your disbelief for a moment and consider the following ideas as ideas for someone else you may know who’s open-minded, adventurous, free-spirited, not willing to settle, tired of not having all they want, or some other way of being along those lines if you’re not… yet. The average American house is probably around 2300 square feet. The average Tiny House is probably between 150 and 400 square feet. Where I live (in Huntsville, AL) you can get a brand new home for as low as $55/sf on the low-end or as much as $200/sf on the higher end. Alabama is much more inexpensive than most areas of the country, so for comparison sake, these numbers are probably even lower than most people would experience, but I want to make a fair comparison. So, at $55/sf you’re looking at a 2300 sf home at $126,500 and at $200/sf $460,000 (though houses at that price per sf are usually much larger as well, so probably closer to $700,000 or more). Now compare that to a Tiny House, which overall would be much cheaper – even fully-loaded with the latest technology, most efficient appliances, windows, insulation, etc and really cool designs and one-of-a-kind features. A prime example is a Tumbleweed Tiny House company, one of the more popular, bigger and more established Tiny House Builders/Manufacturers, who will build for you a 160sf (24-foot long) Tiny House on Wheels (THOW) from scratch, which you can get with lots of options for 70,000 to $80,000 (that size starts at $66,000). So if you calculate the cost per square foot of a Tumbleweed Tiny Home , even just using the base model of the 24-foot THOW we discussed above, we get $412.50 per square foot (keep in mind there are many Tiny House builders and manufacturers out there, with prices for a custom-built tiny house ranging from around $30,000 to $70,000 or more, and sizes as small as you can imagine to upwards of usually 400sf, if on wheels). So what you end up with is a much higher quality, more functional, custom-designed luxury home for substantially less money than even the cheapest 2300 sf traditional house. You pay much more per square foot for a much higher quality house, making every space you’re paying for count versus spending almost twice as much for the cheapest of the cheap quality traditional homes. How does it feel to be paying so much more each month in housing costs for so much less? What do you think? Did I piss you off? I bet I ruffled some feathers with this post! Share below, I’d love to hear what you think. I appreciate you! PS> Have you seen our facebook page for the New American Dream Project? 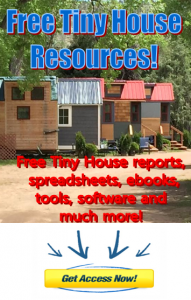 We’re using Tiny Houses to help people create Freedom in their lives, in numerous ways. Come visit our page and say hi! And don’t forget to LIKE the page so you can stay in the loop and watch the project progress – it’s exciting! Honestly, is Freedom the first thought you have when you think of a Tiny House? For most people it probably is not – but it should be! As Americans, we like stuff. We like buying stuff in order to solve a problem or need (which we may or may not have had prior to watching the infomercial… lol). And there’s nothing inherently wrong with stuff (or liking to buy things…). However, are all those wonderful things you’ve bought because you had to have them actually solving your problem, making your life better, making you more than you were before? It just sits in our house under the bed, in the closet, on the shelf or some other out of the way place so that someday just in case we might need it, it will be there. Or you may even just hold on to them as trophies. And there are some people who actually cling to stuff or hoard because they are afraid of losing something. First of all, you are enough just as you are and you don’t need any thing or possession to complete you or make you who you are. Again, there’s nothing wrong with having things, but they don’t determine who you are, no more than your job does, your house, your car or your hobbies. You are you, and those are simply things you have or things you do. I’m getting a little off tangent here but I think this is a key point that many people overlook. They cling and hold onto stuff out of fear (of loss) or perhaps even to avoid something else in their life that they’re trying to cover up. But when you “pair down” as they say and start to rid yourself of the clutter, you start freeing yourself, layer by layer. You begin to feel lighter, more raw, more free. It can be a scary feeling if you’ve been buried underneath all your stuff for years and years, but once you experience how great it feels, it can even become addictive and your life begins to shift and transform and you really start to LIVE! You see, I’ve gone through this transformation initially when I went through my divorce. After carrying around all this stuff year after year, home after home – and all the emotional attachments I had added to it all – it got real heavy, figuratively and literally. And I’ll be honest, after 15 years there were emotions there that got triggered by the parting of some of the stuff. But I got to the point where I realized none of that stuff mattered. All my “stuff” is what was keeping me from really LIVING life. I was holding on to everything around me so tight because I thought it meant something about me, I thought it was part of my identity (subconsciously of course, I didn’t realize this until after I started letting it go). Case in point, a few years ago just trading in my car for another, better vehicle was so hard – or so I had convinced myself. But then we traded in the car that I thought defined me in some way (even though I didn’t want it anymore) for the car that had the features we now wanted, and I pretty much completely forgot about the old car! Crazy, right? I realized that I was holding onto stuff so tightly because I must have subconsciously believed that I wouldn’t have that thing again, or that I couldn’t have that thing again. Again, totally false! In fact, it opens up the space to have something even greater show up. In terms of dollars and sense, I literally was paying money out each month to store, condition (heat and cool), pay taxes on, insure, clean and maintain the extra space, money that could have gone towards going out, traveling, throwing an awesome party, going skiing, or whatever else. Again, lots of stuff that sat on shelves, in closets, on bookcases, under beds, etc, etc. I had spent so much time compiling all my stuff over the years and thinking it meant something about me until I got divorced and realized it was just stuff. Throwing stuff out, giving things away, selling furniture, emptying the house out was such an exhilarating and liberating feeling (and you don’t have to get divorced to do it; in fact, it might even help your marriage if you throw out all that baggage sooner than later!). So what does all this have to do with Freedom? The truth is each of us has the power within us, if we so choose, to create the freedom(s) in our life that we desire, if we are so bold and inspired to do so. With that said, living in a Tiny House can be an awesome vehicle (literally) to help you LIVE that freedom lifestyle. This is probably pretty common sense if you have a Tiny House on Wheels (THOW), as you up and move to another location whenever or if ever you should feel like it. The house is on wheels and you just hook up your Tiny House to your truck and off you go, be it for vacation, to visit family and friends, to go skiing for a month (yes! ), to the beach for the summer, or to explore a new state or region of the country (or world!). All you need is a place to go (learn more about The New American Dream Project and the Tiny House Communities we are creating here). Each Tiny House is a unique, custom building. There are so many different options, so many different ways to go that you can be free to really express yourself as much or as little as you like. You’re not worried about making sure its got the right colors or landscaping or furntiure in it so that it will resell well, you’re focused on LIVING. So paint it whatever colors you like, decorate it how you want, add a living roof, drape plants over the side, throw a hot tub down in front, whatever. It’s your house and if its on wheels more than likely you have no building codes or restrictions to prevent you from creating just the perfect house, how you want it. That’s personal freedom! How would your life look if your expenses dropped $1,000 a month or several thousand dollars a month in some places, depending on where you live? Would that help you rearrange your finances to get you out of debt, build up an investment account, or maybe start up a business from your tiny house? Maybe you could retire now and stop working altogether and live off your retirement or investments now while you’re as healthy and young as you are before you’re at a point where you’re physically unable to enjoy a retirement? As you can see, living in a Tiny House is all about Freedom. But it has to start with the desire to be free. If you’re content living in your home or apartment with all your stuff, your finances are in order, you’re happy with your experience of life and have no desire to really live more, then a Tiny House may not be for you. But on the other hand if your mind is going and you’re thinking of different possibilities and more of life that you’d like to experience and you’re ready to move forward and create the life you want, then living in a Tiny House may be just what you’re looking for. Need a place to live in a Tiny House? We are creating The New American Dream Project for just that purpose, to help people live that Freedom lifestyle through Tiny House Living in Tiny House Communities. Learn more in this blog post here. PS> Have you found us on facebook? Like our page and stay up to date with the latest project happenings, news and announcements!